If I am leaving before noon, what are my top two airline options at each airport (JFK, LGA, EWR) that will have the least amount of delay time? At first I created a summarised table that displayed each airport's top two airline departure times (smallest departure delay) on average. I can see there are quite a few outliers but my thought is to keep them in the dataset as they provide valuable information on how badly a departure can be delayed at times. After getting a glimpse of the entire dataset, I wanted to look closer at departure times that are negative (meaning departed early) or around zero. These plots are valuable but don't really make it obvious which airlines and airport would be the best for me to take given all the information I have. 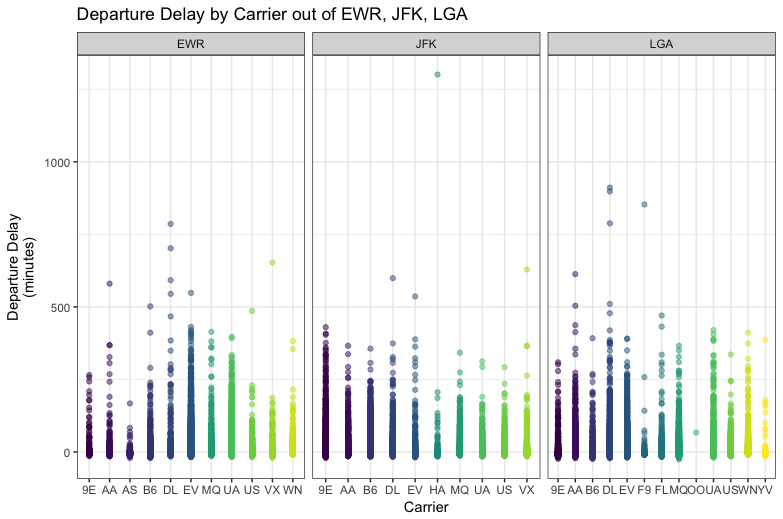 My next thought is to estimate the CDF for each airlines departure delay and then compute $P(X \leq 0)$. At that point I can then select the airlines that have the highest probability of having a departure delay of at most zero. Is this sound statistical reasoning? Is there a test I can perform that would be better? I Really would just like some guidance on thinking this problem through. If this is sound statistical thinking, are there any resources you can direct me towards that would teach me how to implement it in R? Data visualization is always a great way to start. Here is how I would approach it. Since you are only interested in before noon - limit all data from 6am to noon. Run three different ANOVAs (delay time as dependent variable, aircraft carrier as independent variable) for each airport. Or you could run one model including airport as another main effect along with the interactions. Examine residuals for severe violations of model assumptions. 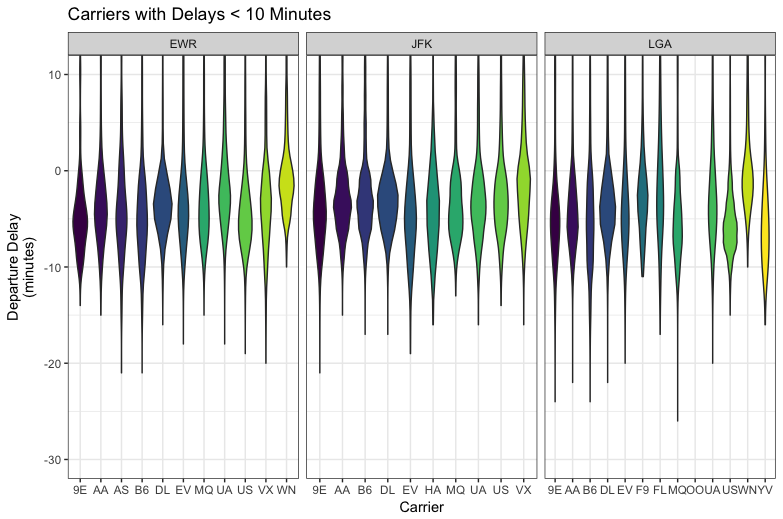 Investigate the output to see which airlines are significantly shorter in flight delay. Will need to do some multiplicity adjustments. Googling ANOVA and R will give you plenty of material. There are other questions to consider such as do I want to almost guarantee a delay time of less than 30 minutes compared to no delay time at all? This, I believe, requires more advanced models. To answer this I would use a Bayesian approach in JAGS and compute theses posterior probabilities. However, for your sake, I think you can just focus on least square means from the ANOVA models. Not the answer you're looking for? Browse other questions tagged r probability self-study experiment-design or ask your own question.